When we came up with Arduino, one of the things we decided very early on was that we wanted to release the hardware design files so that people could make their own versions or just make an exact copy if they couldn’t find boards where they lived. I think we contributed to popularize the concept of open source hardware and we can see it from the huge amount of variations of Arduino-compatible devices being released every day. We decided that the best way was to register the trademark of the Arduino lettering and to create a logo that would make it easier to identify products sanctioned by us. A few years later the situation is clearly complex with so many companies identifying something as an Arduino even if the only thing they have in common with us is the board pinout. It’s time we clarify what in our mind is an Arduino, what are the different variations of Arduino around and how they relate to our project. We classified them as Clones, Derivatives, Compatibles and Counterfeits. But let’s start with explaining what is an official board. The authorized manufacturers pay a small royalty to Arduino to keep the project going (pay for the servers, the people who develop the software, design the hardware, write documentation and provide support, etc.). We sign contracts with them and all the authorised distributors that make sure they will replace any defective board should the customer receive a product they feel is not working properly. Although the percentage is incredibly small (less than 1%) it’s still important to know that somebody will take care of any issue. Through this system we have enabled people to have access to cheap hardware that is properly supported and the community can build upon. These are the only boards that can legitimately use the Arduino name. Current official manufacturers are SmartProjects in Italy, Sparkfun in the USA and DogHunter in Taiwan/China. These are the only manufacturers that are allowed to use the Arduino logo on their boards. A market developed for products we call Clones which are exact (or almost exact) replicas of Arduino boards with a different branding , i.e. they are usually named with some variation of Ardu-something or something-duino. These products are released according to trademark laws (unless they copy almost exactly our graphics which is not open-source) and have a place in the market. Customers who want to support the Arduino project should be aware that these products do not give back anything financially and very rarely in term of help on software or documentation. A more interesting segment for us is what we call Derivatives. These are products that are derived from the Arduino hardware design but they innovate either by providing a different layout and features often to better serve a specific market. 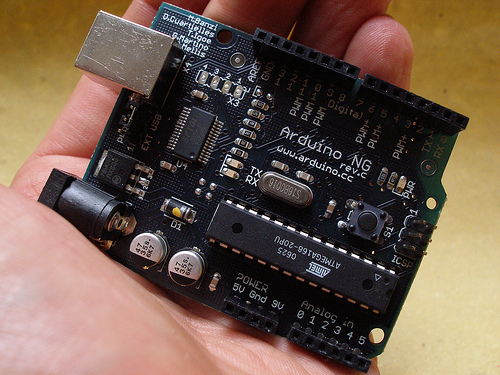 These are the products that have also helped Arduino become so ubiquitous. Teensy by PJRC – Paul has contributed a lot of code, bug reports, pull requests and to the discourse in general. Flora by Adafruit – Limor has contributed over 100 libraries and countless tutorials about Arduino becoming one of the most important members of the Arduino ecosystem. There is also a hazy cloud of products that call themselves “Arduino-compatible” but their actual compatibility is sometimes really marginal. We go from products that have a semi-compatible port of the Arduino API but use very different processors, to boards that call themselves an “Arduino” just because they have a couple of connectors mechanically compatible with Arduino. This, for example, is very common on Kickstarter where a number of projects try to get traction by using (sometimes obsessively) the Arduino keyword throughout the project description. Normally we’re pretty relaxed about these unless they are really shameless, then we email them and sometimes they realize they have gone too far. Finally there is a category of products that are really detrimental to the whole open-source hardware movement, we call these “counterfeits”. These are boards that clone the official board including the Arduino branding (logo and board graphics). Since the Arduino graphics is trademarked and we don’t release any of the files, whoever uses our graphics and logo makes a deliberate act of Trademark infringement. These products not only trick people into thinking they are buying an official Arduino (therefore supporting the Arduino project) but they also provide no support. We’ve had many reports of people buying these products and finding out they are damaged but unfortunately for them the manufacturer is nowhere to be found to provide a replacement. The most common place where counterfeits can be found is usually on auction sites. Special mention is needed for Amazon.com because of the way the website works: they pool together all the suppliers of a certain product. When the customer buys an Arduino they might get a counterfeit depending from which stock they used. From our side it’s hard to stop them because if we report a counterfeit Arduino on their platform, they will “kick out” all the suppliers including the legitimate ones. We’re still trying to find ways to communicate with Amazon but it’s not easy. In any case you can read this page explaining how to spot a counterfeit Arduino. We believe firmly in open source hardware and we have always systematically released any hardware design and the software needed to reproduce our products. We think this advances the whole community and provides a platform for shared innovation where the advantages are more than the drawbacks, but we also think that Trademark violations are like identity theft: the same way each one of us wants to have the right to own their name we believe we have the right to decide whoever gets to be called Arduino, everything else is right there on Github for anybody to build upon. Great post. We’d noticed recently that the number of Counterfeits on the market has gone through the roof (being sold in the UK at least). We try to report them when we see them to the likes of eBay, but as we’re not the TM holder they don’t take much notice. Amazon for example don’t even have a method of reporting, which is pretty poor. We’ll pass around the how to spot a Fake Arduino and do all we can help combat it. I see your Problem with the Clones, and I see also, you need some money to sustain the platform. But, the difference in price is much higher then 1% between “clones” and genuine Arduinos. For example: Sparkfun Arduino Mega 2560 for $59.–, Clone on eBay for $18.–. I think, something between this both prices would be great! The whole Kickstarter thing slips in and out of grey areas, most recently I guess with the whole Yellow PCB’s that will remain nameless “made by former Arduinos manufacture” who turned out to be some guy who was a Machine Operator or Solder Technician who used to work in a random electronics factory who were sub contracted for two short periods to produce parts for two batches of official shields in very small numbers. All my Arduino boards have been purchased from an official stockist here in the UK who I trust, and my current Uno, Due and my lovely little Duemilanove Limited Edition are all from them and are most certainly the real deal!! I made the mistake of buying a Mega ADK last year from eBay which was listed as official, brand new etc etc.. and when it arrived and I opened the packaging I found a plain brown box with a Mega ADK shape board in with all the markings that the official boards have but on closer inspection the silkscreen printing was all blurred and on the rear it had printed in a similar manor to the official version “Arduino Mega ADK for Android R3” but when compared to the pictures on the Arduino site of the printing on the rear it was totally different. Needless to say that it didn’t function as an ADK version should and the extra USB input was totally useless and from a quick trace back to the SMD’s and IC (which was unmarked) it was obvious that it was a standard Mega 2560 Counterfeit and the extra ADK function was just fake and not really connected to anything. Reported to eBay along with photos and comparisons to the online photos of a real Mega ADK R3 and was quickly refunded by PayPal and a few weeks later the seller had disappeared, im guessing they were banned or were just getting out as many cheap knockoffs as they could before closing the account and creating a new one with different credentials. I used the board a few times as a standard Mega but it had serious issues and half the time would not connect and would often reject uploads of sketches. Its crazy, these days virtually everything with any value has been counterfeited somewhere and there are many who try and jump aboard the Arduino train by making extraordinary claims all of which never work out. Kickstarter is certainly a prime example of a breading ground for this type of thing and they need more measures in place to prevent certain companies from selling devices with false statements about their history and connections. The “Yellow Boards” (That are now over half a year late with 95% of backers still with empty hands and the few that have received the most basic kits complaining of various issues including buying into this whole “unique connection bus” but there being absolutely no accessories available to plug into them and the main ones flawed with pins in the wrong order or the 3v3 and 5v pins the wrong way round etc… Its people like that who give the open source and open hardware community a bad name! Keep up the great work guys, I will certainly only ever buy Official Arduino Boards with the only exceptions of the honest makers who are upfront about their product being derived from an official board and giving full credit of the main design to Arduino TM. There is currently one in the works who have added to the design & expanded on-board functionality by creating a Derivative of a Due for example with a Wifi, Micro SD card slot and RF radio built in on board. I’ll second the Amazon problem. I ordered an Arduino from Amazon, thinking that if it said “sold by amazon” it meant it was vetted and official. That apparently isn’t the case. I received a counterfeit and asked for a replacement that never came. Needless to say, I’m not buying Arduinos from Amazon anymore, Sparkfun’s my main source now. I sustain Thomas Riesen post, as clones and derivatives are as good as the originals and the documentation and tutorials are very well covered by sites all over the internet. A good mark will cover all you have to offer: mikroElektronika have a nice little board, http://www.mikroe.com/mini/at/ at a super good price. And another very important thing. Actually, the clones of Duemlianove board are better than the UNO board as they come with the ISP programmer on board which can provide auto repair functionality to your Arduino board and anyway, an universal AVR ISP programmer which justifies the high price. A thing that the UNO unfortunately dropped (without any justified excuse). A fantastic reason to buy that instead of a UNO. What does this get filled as? Officila, Clone, Derivative or Counterfeit? I bought a Funduino, a clone of the UNO R3, because the price was just to good to be true. It worked real well for three hours then the USB died. What is it they say about deals that are too good to be true? @David it’s even worse than you think. It’s possible to send Amazon stock and to tell them that is Genuine Arduino – they will add it to the pile of Arduino unos in the warehouse and dispatch when sold by any distributor that uses fulfillment by amazon. We don’t use FBA! I feel the clones definitely have a place in the market. The counterfeits definitely do not. I have a few official products, and I bought a clone from amazon (not a counterfeit, it said “arduino compatible” just like it’s supposed to) and I couldn’t be happier with it. No problems whatsoever. I feel that the clones are in the spirit of open source. It doesn’t make sense to me why someone would counterfeit, when it is just as easy to follow the rules that were laid out and make a clone. The current project that has just popped up on Indiegogo is a perfect example of people not playing by the open source/hardware rules and giving 2 fingers up to Arduino TM and EVERY company that make AND/OR sell legitimate Arduino TM products or high qualitly Clones or Derivatives in line with Arduino TM’s guidelines and opensource etiqute. What this particular person/company has done is release what they are calling a 100% compatable Arduino clone and have put it in for stupidly low prices to try and gain a % of the market by undercutting the hardworking and legitmate retailers who play by the rules and either sell official products or kickback a small % of their profit to the community to help further develpment AND/OR help the Arduino and maker community in other ways. Selling what they are calling a 100% Arduino Compatable Prototyping Electronics Board for $9 including worldwide shipping is an absolute insult to Arduino and to every single company, store and person who make, sell or buy official or officially recognised clones and Derivatives by undercutting prices by over 50% in most cases. I see it as a direct insult to Arduino and im betting there are alot of retailers worldwide that are not impressed by this act. HOWEVER, One thing that is not imediatly clear until you go to pay for your pledge is that the money infact does not go directly to the person who is said to be running the project, it actully goes directly back to the same company who Arduino TM had disputes with over branding and claims about previous employment late last year. That project was run on kickstarter and had a ETA of Jan/Feb 2013 but as yet (and this is confirmed my the project’s designer) only ~20% of those Kickstarter rewards have been produced and only ~5% of backers have received their orders!!! These so called $9 Arduino Clones are made by the same company and in the same factory which have been unable to fulfil even 5% of its existing orders, so I really dont see how they plan to produce yet another product before they have even produced and tested working prototypes for their on-going project?? This is NOT a personal attack or any kind of post aimed to Troll/Flame or anything else other then give the facts. If you doupt about the facts here then head over to kickstarter and IndieGoGo and read through the comments sections on both projects, you will see a common link between the two along with confirmation (on the KS site) about the status of the original project mentioned here and in my previous post. I beleive this is something important and valid that people need to be aware of and a perfect example of a company/person(s) trying to out price all other producers on Arduinos and legitimate clones and Derivatives that all stay within the same price range. By cutting those prices in half means that the boards WILL be of lesser qualitly than an official board and you are highly unlikely to get any further support from them. Its also as I said a blatent and public 2 fingers up to the entire Open Source/Hardware community and #1 at Arduino TM themselves! and when you get a board shipped for less than 8e…. that’s a big difference for a hobbist… i want to support open source but i can’t afford to buy the exact same board for the double price + shipping…. that’s almost 3 times the clone price! Clones emerge only when there is an ecosystem to support them. IBM clones were bred by the huge margins IBM asked back in 1982 – so legal clones emerged. Similarly an arduino clone can only emerge if the real arduino makes a large margin that allows someone to make the board and sell at a lower price. I would like to know the raw cost of an arduino board. I see that Dimitri board sold as an exact clone for $9 and Dimitri makes money. If the real Arduino costs $5, then Dimitri’s board will cost ~~the same, and possibly more, since Dimitri does not buy in 50,000 lots. So Arduino can kill the clones by selling at a price point where they get no traction and do not bother, and that means kill bare board clones as well as populated and tested clones(if clones are properly tested at all??). Clones that use parts scavenged off other boards with hot oil parts remover have an unfair advantage of low parts cost, as well as the risk of cooked parts that soon fail. So I would like to see the parts list and cost of the real Arduino, board as well as parts, solder assembly cost and text and package cost – as open source, this should be freely given. It will also assist in detecting possible bad clones with parts cost so low they must be used or badly made to allow the customer to reject the purchase. In a retail store we can pick out badly made parts, clothes etc, and reject them. In an online venue with copied pictures we have no guidelines. My first Arduino based board was the Helios gadget (http://www.heliosgadget.nl/index.html) and as they state on the (Dutch) website it is a board based on the Arduino platform. The board is not for sale, it was a gift at an electronics trade fair in the Netherlands and a good example of how to promote Arduino. Another board I just got is the Megatronics 3D printer controller – also not an Arduino board. 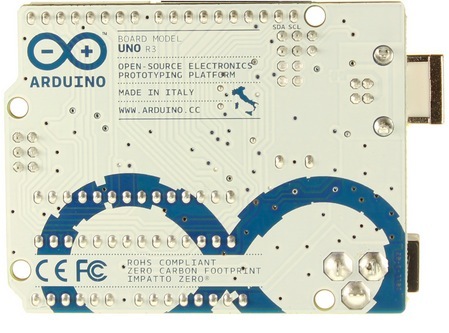 But I am already looking at buying some Arduino boards and I almost ordered then in HongKong (20 USD incl. VAT and P&P compared to € 39,- ex. VAT ex. P&P for an original seemed too much difference). But after reading this article … I’ll definitely go for an original Arduino from one of the official resellers to make sure that at least some of my money flows towards the Arduino development. The BOM for an Arduino just isn’t that high. You can build your own UNO compatible for about $5 in parts, so expecting people to want to spend $30 + tax and shipping for something they are going to embed within a project is optimistic. While I agree that counterfeit boards are beyond the pale, opening up the design is bound to mean that any popular model is going to be cloned and there’s not a lot they can do about that (other than making their products preferable due to quality and support, and that’s a hard sell at more than $20 per board). Progress on new models and the IDE could however be faster so I’m not sure we’re seeing that. However, as Bill Jackson pointed out, the cost difference is just unbelievable sometimes. If you compare Seeedstudio for example, I’m sure they have almost the same costs to maintain their website and to make their boards, and yet they can offer a very good price, with more components and better design options than the original board and at a better price. Obviously people selling clones on eBay that may or may not work, don’t have any associated costs and therefor can sell them very cheap, but there wasn’t really nothing to stop them. All they had to do was download the gerber files and send them to their PCB manufacturer. On the other hand, as others pointed out, these clones also give momentum to the Arduino movement… the problem, it seems, is that it does so without any financial reward. A bit like the gillette… where every disposable razor is a gillette without actually being one. I’m not saying I agree with Counterfeits. That is just wrong, but as with other products that are counterfeited there is a reason for that and with the Arduino the reason might be the price point. For me, the reason, apart from price, is really the design of the board. The ancient USB plug that make it very hard to plug some shields, the via that you have to cut to disable the auto-reset instead of a switch, the reset button being inaccessible… all these are serious flaws for a board that expensive. My first couple of Arduino boards (Uno and Mega) were official ones, but never again! After I realized how ridiculously high the price of the “official” Arduino is, both locally sold in stores in India, and online from the official sources mentioned in this article, I went looking for alternatives. – The InduinoX from SimpleLabs.co.in (India) adds some terrific features for an experimenter, including RGB and infrared LEDs, infrared sensor, excellent resistance to rough handling and even dunking in water *while it is running* – See the videos on YouTube. My original Arduino didn’t do so well – I’ve ended up exposing both boards to some pretty nasty conditions over time. The price of the InduinoX is decent as well, despite all the extra bells and whistles built into the board. The InduinoX is officially recognized as a derivative board on the Arduino site, as well. – The Meduino Nano Enhancement, bought off various Chinese sellers on multiple sites, is excellent value for money at a typical $8 to $12 including international shipping. The board quality is excellent, and the finishing is better than both my SparkFun Uno and my UK-purchased official Mega – this is after nearly a year of exposure to rain and dust outdoors, in one such board. Also, it adds an excellent enhancement that I wish the official Arduino boards would copy: A little DIP switch on the board allows operation at 3.3 or 5 Volts as desired. This is invaluable when using the board with sensors that operate at one or the other of those voltages. In short, I’m happier with the clones and derivatives both for product quality and features, and for price. Note that I have also purchased several less stellar clones and derivative boards, including a claimed “officially licensed” Duemilanove clone board from RoboSoft.in that spontaneously died in two days, at which time RoboSoft India point-blank refused any support. My experience with those other clones, excluding the InduinoX and the Meduino Nano Enhancement, has frankly not been great – not better and mostly not worse than my official Arduino boards. I hope these are legit…. Basic Arduino price is fine, although I wish the large USB connector would be replaced by a micro connector. There is value in a deritive board that uses a processor different from the official arduino. Case in point is the ATmega1284. This processor is lower in cost than the ATmega2560 used in the mega (or the ATmega1280 in the previous version). It has four times the program space of the UNO, and eight times the data memory space, as well as about 1.5 times as many IO pins. No ‘official’ arduino board layout exists, though there are a few open source designs out there, as well as a well written extension for the IDE. It’s been called the ‘goldylocks’ chip because it’s not to small, and not too big. I’m using and available 40 pin AVR prototyping board with this chip and the IDE extension on the Arduino software platform. It works great. I used to buy Arduino clones on Ebay, (funduino for example), with excellent quality and low price. Very good deal. At the same time, I understand the effort made by Arduino company, so I really want to support the project, so please Add a Paypal Donation button in your site, in this way a lot of people can support the project without the need to buy an Official Board. COMMENTS: First Kudo’s and congratulations to the Arduino team for creating a product worth cloning. Imitation is the sincerest form of flattery! As a hardware entrepreneur of 30 years (and successful some of the time) I would love to tell my grand kids I did a product worthy of cloning. Cloning has probably made the product more successful like it or not. Unfortunately the arduino is a trivial design to clone. 1/100th of the effort to clone a PC in ‘the good old days’. TO THE CLONERS: Seriously? Is that all you learned in engineering school, how to copy? It does not take a rocket scientist to see MUCH room for improvement in the base design and a million ways to add features, reliability, and robustness to make a better product. Oh and I’m going to do it just to make my point ;-). Actually we already did it with the arLCD Arduino Compatible SmartLCD http://earthmake.com/products/arlcd/ . ARDUINO TEAM: The ‘Arduino at Heart’ program that was discussed several years ago was a great idea. This implemented by an Arduino staff business development manager might be able to generate the revenue you are losing to the clones. The only way to not get hardware copied is to have a low cost advantage or an ASIC (custom chip or maybe just have Atmel package the micro differently). If you were to have a hardware summit and invite community engineers you would get even better ideas. I have no problem with the criticism of counterfeits, that is plain and simple wrong. However the (implied/real) hostility to clones makes no sense to me. 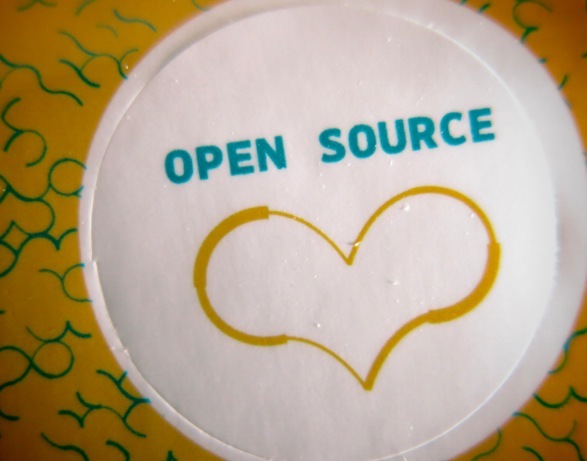 You published it as open hardware and open source, so it is everyone’s right to make clones. But also you seem to make a difference between those clones who contribute back and those who do not, implying that the latter category is somehow less worthy. I think this is a false distinction. Every arduino compatible system out there helps raise the profile of the Arduino platform, and adds to the body of people who will choose arduino in the future. My favorite places to buy Arduinos are SparkFun and Adafruit. Sorry to all you non-business owners that think money grows on trees. Your forgetting legal fees, power, website, salaries, R&D, import tax, export tax, corporate tax, sales tax, state tax, federal tax, shipping, logistics, advertising, accounting, savings/investment, etc. and those taxes are just U.S. based. I’ll bet on a $30 retail board there is a cost of $20, and a 50% profit margin isn’t bad. And if you think its that cheap, why weren’t all these companies making these boards first, its because the Arduino team did all the hard work, and are now being exploited. If a company is legit enough to sell a clone, its because they’ll make the money elsewhere is accessories, if not they’re selling a counterfiet to get massive profits, as they only thing they have to provide is the board. $30 for such an awesome device, is the equivalent of one tank of gas, or one trip to a fast food restaraunt, or one movie, yet 1000x better than any of these, yet I bet all of you do those things on a regular basis. You hypocrites, those companies aren’t even 1% the company Arduino is. I’d like to thank Arduino, for without them we wouldn’t be having the hacker/maker/DIY/open hardware revolution we are having, which in my mind is priceless. Crying about people “copying” an open hardware platform is totally senseless. I understand that Arduino does the R&D and these other companies profit off of it but if you didn’t want that to happen then you should have never made the platform open source to begin with. The reality is those other products still elevate the platform anyway. When I first got into this stuff I bought an official Uno. Since then I have purchased official products as well as the clones. The problem is that I can’t always afford to spend $40 to put an official board in a finished design, so if it weren’t for the clones I would have stopped buying Arduino products completely, official or otherwise. I really hope Arduino doesn’t start going the way of all these other dinosaur companies that only think of maximum profits because it will be dropped by most enthusiasts in a heartbeat. I own two original Arduino-Boards (Duamilanove and Mega) and i’m happy with them. When I bought them they where around 35 Euro and 50 Euro. 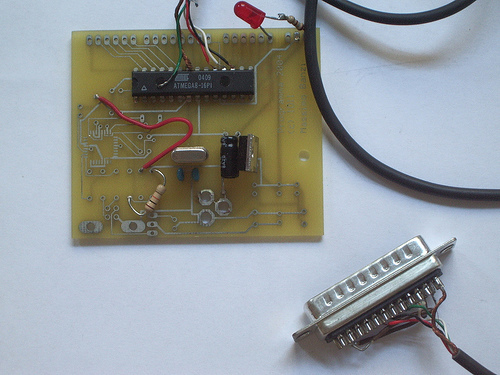 For my latest projects i use self-solderd-Clones or Breadboard-Arduinos. I think this is what the maker movement is about. but I think the prices of the originals are to high for casual users. Especially some of the shields are just ridiculously overpriced. In my case I made a informed decision to buy clones from sainsmart. What I also do is to buy naked atmega2560 chips on a pure breakout board, 20€ each. Yo lo siento mucho, pero seguire comprando arduinos y placas clones, es verdad que dan mas problemas pero con un poco de conocimiento en electronica las haces funcionar a mitad de precio que un original. Yo he comprado arduinos micro a 2$, mucho mas barato que el original. Ademas somos los usuarios los que mantenemos las librerias y generamos nuevos codigos, las empresas solo lo hacen para poder vender mas no por el bien de la comunidad. I just barely got into hobby electronics after becoming obsessed with troubleshooting an old motherboard. I began reading everything I could about electronics at SparkFun, and due to all their references to Arduino, I was introduced to your products… and then became completely discouraged by the prices. I just bought my first Arduino knockoff. I _never_ would have considered it if I had to pay official prices for your “open source” designs. As far is I understand, this website with all it’s content is licensed under the Creative Commons Attribution ShareAlike 3.0 license (see copyright notice below). This gives you the permission to copy and share the content – as long as you give “attribution” and say who is/are the original author(s). And also it gives you the right to make derivative works (e.g. translate it) – as long as you “share alike” so that the derivative work (your translation) will be Creative Commons ShareAlike again! I think things happen for a reason. That the clones are so popular is not because they are cheap, but because they are cheap and useful at the same time! Their share in the market actually helps motivate the industry development since it helps more people than if there is none of them. Clones are fine. It’s when they use the Arduino silkscreen with all the “Impatto Zero” stuff that I start getting angry. There is one counterfeit I bought that had the “Arduino” and the + – infinity sign removed. I am slightly happier about that. And it came in a LinkSprite box. Yes, the makers of PCDuino. Thank you for a very informative post. I have a total of 4 arduinos, two of them were made by Inland (microcenter), one is a redboard (Sparkfun) and the last I got from eBay (from China, for like $3.00). Could not pass up the last one, but did not know better back then. Of all these, my preferred in the Sparkfun and glad to hear they’re an approved manufacturer. Now, how about the boards from MicroCenter (Inland)? Are those legit? MicroCenter sells the UNO R3 for $5.00 and it apperas they’re selling tons of them.